Learning to hover a helicopter. 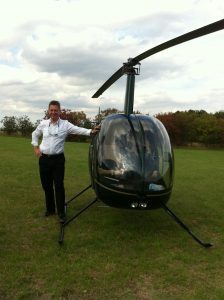 For some people, especially those from the x-box generation, learning to hover a helicopter is easy and straightforward. For the rest of us, it’s possibly the most difficult physical skill we will ever master. Start by getting your head in the right place. Don’t pressure yourself. OK, so your instructor seems to be able to keep it perfectly still in a howling gale while talking on the radio and adjusting the altimeter. You’ll get there, but don’t judge yourself by comparing yourself with him/her. It’s going to take you time to get there. Hours maybe. I start by showing what happens if I freeze on the controls in the hover. Slowly at first, then with increasingly alarming speed, the helicopter moves, tilts, climbs, descends and generally goes weird on you, under the influence of gusty wind and its own instability. Hovering is the art of resisting the helicopter’s tendency to go weird on you. Next, I give you the controls one by one, starting with the pedals, with an explanation of what each control contributes to the situation. I’ll do the other two controls, you just play with the one I give you, to experiment with what happens when you make inputs. Usually, as with most things in a helicopter, you make an input, and the helicopter accelerates in the direction you have commanded. So you have to make the input, then moderate the acceleration. With the pedals, there’s an accelerative rate of turn, which you need to moderate, then to complicate things there’s the influence of the wind acting to keep the helicopter into wind. Focus on these factors, and become familiar with it in your conscious mind. The process of learning to fly a helicopter is one of getting the hang of things consciously, then allowing your unconscious mind to take over the doing of it. It’s too complicated to be able to do it all consciously in the long run. Next is the collective lever only. Up, down, trying various rates of climb, working out how you stop it hitting the ground, and so on. Note how gentle you need to be with it. The more aggressive your inputs, the more sorting out you have to do as a result. Again, give it a thorough go with your conscious mind, and hope your unconscious mind is taking note. Then I demonstrate how if I freeze on the pedals and make lever inputs, the nose goes left and right as I go up and down. You can then try the pedals and the lever together, remembering “down right”, to get used to keeping the helicopter at the right height, and always pointing in the same heading. Note the effect of gusts on both your height and your heading, especially if the wind is around 10knots, as you’ll be in and out of translational lift. So now you have what I call the platform on which you base your hovering; left hand and feet. Now you just need to learn to use the cyclic stick to keep the thing reasonably still. To start with, we are just looking to stop the helicopter tilting, or “dishing” left right forward and back. I call it dishing because, when you let it accelerate, it will behave as though it is flying inside a dish, and being forced to climb up the sides. Moving slowly around the field is ok, but not dishing. I start by demonstrating how if I change the centre of gravity of the helicopter, it tilts, pauses and then starts to travel. Once it has started to travel, it accelerates until it flaps back. (For flap back, think of your baseball cap’s peak flapping up when you go really fast on your bike). So that’s tilt, pause, travel, flapback. I demonstrate it by simply moving my own body right towards you, or left away from you, or forward or backwards. From a stable hover, doing each of these movements will shift the CofG enough to tilt the helicopter left, right, back or forwards. Looking outside, you’ll see the horizon tilt relative to the helicopter. Train your brain to recognise those horizon tilts. So now I’ll take the pedals and the lever, and you take the stick. As soon as you see the horizon tilt, note the slight pause, then notice the helicopter begin to travel in the direction of the tilt, then note the flapback (which is what I mean by “dishing” – it’s as if the helicopter is climbing up the inside of a dish, towards the rim). So our perfect hover is within the pauses. You notice the tilt, and in the momentary pause you make a cyclic stick input to correct the tilt, before it starts to travel. That’s ideal, but input before it flaps back is good enough at this stage. The cyclic stick input is a small dab away from the direction of the helicopter’s tilt, and then back to centre. Constant process. Tilt, pause, dab, centre. Tilt, pause, dab, centre. Don’t worry if it travels around slowly (without flapping back). You’re nearly there. If it does flap back (because you haven’t dabbed in time), I usually take control and resettle to a hover, as that bit is quite hard and demoralising for the student. Bit by bit, the conscious mind begins to get it. It could take a while. Relax, we’ve all been there. Gradually it’s less of an effort. Once it’s there but still an effort, I get my student to count backwards in threes from 73. This takes conscious mind effort, so forcing the unconscious mind to attend to the cyclic stick inputs. By the time you can count backwards and hover with the cyclic, you’re ready to add the left hand as well. Don’t worry, it’ll all fall apart initially as your brain works out how to apportion processing resources to each hand. Keep on starting with individual controls, then adding a second control. Once you’re ok on two controls (and can backwards in threes from 73 to -73) you’re ready to add the feet. When you’re on all three controls, note which control seems to be weakest (usually the feet) and go back to that one on it’s own. Try to relax on the stick. A death-grip will make it harder. Don’t over-grip the lever. The governor needs to do its thing. Listen to your instructor, he/she is there to keep you safe.